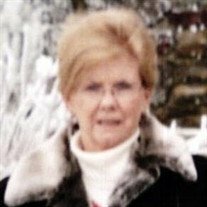 Charlotte J. Buck, 75, of Jacksonville, left this earth Thursday, September 13, 2018 to be with her Savior Jesus Christ in her Heavenly home. She was born March 14, 1943 in Daisy, Arkansas to Dewey and Opal Johnson. Charlotte is survived by her husband of 55 years, Jim Buck; sons, Brent Buck, of North Little Rock, and Marc Buck, of Sherwood; grandsons, Dalton Buck, of Jacksonville, and Blaine Buck, of Malvern, as well as one sister and one brother. She is preceded in death by her parents. Charlotte was a member of Sylvan Hills Church of Christ since 1970 where she spent 35 years in the nursery and kept children's church. She volunteered at CAC elementary and high school for many years. Charlotte was the best wife, mom and Nana anyone could ask for. She was the rock for our family. She always put others before herself in everything she did. In lieu of flowers, memorials may be made to Sylvan Hills Church of Christ Children's Ministry or St. Jude's.